My most used apps of 2011 include an endless list of Twitter apps, ‘video streaming apps’, and of course, the default apps like Safari, Mail, Messages and YouTube. When I do download apps from the App Store, I immediately store them into folders: "Games, Utilities, Utilities 2". However, there are a select few apps that live outside of folders, because I use them so often. Here are the top 5 that I’ve used this year. I’ve used a few Twitter apps this year. I used Tweetbot, TweetTime, Tweetings, but most of the time I ended up reverting back to the official Twitter app, but when Twitter updated their iPhone app to #dickapp, I went on a search for another Twitter client. 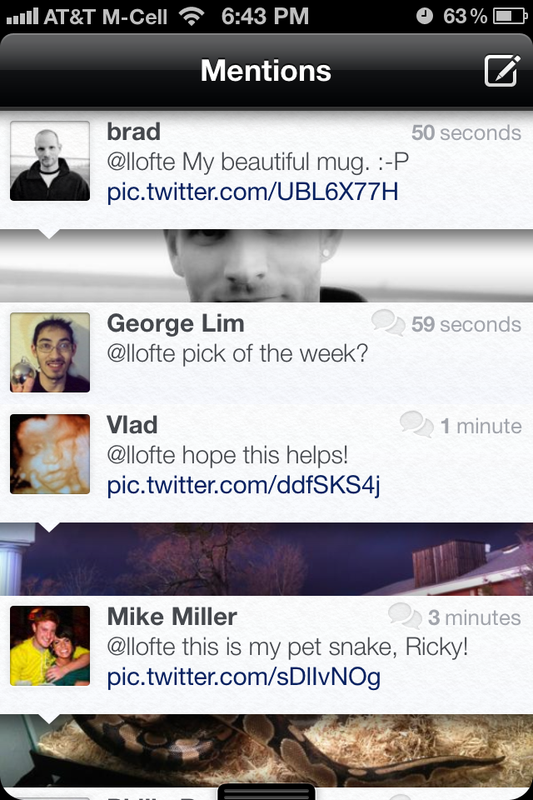 That's when I found Twittelator Neue. Its gorgeous and was made for iOS5. Its got most of the features you'd expect from a Twitter app and is definitely the app that I will be using in the foreseeable future. So what if it doesn’t have push support yet? It’s so pretty! The iPlayer app is on both the iPhone and the iPad, however I love them both for different reasons. The iPad version is my No.1 source for my BBC content. Its easy to navigate and lets you save a list of favourites, so I never miss a show. Its so convenient for watching my favourite BBC shows in bed before I go to sleep. The iPhone version wins me over because it has 3G support and live channels, so I can watch TV, while I’m out and on the go. Tiny Tower is an annoyingly addictive game. I'm constantly checking my tower and improving it. It's almost become part of my everyday routine. 'Wake Up, Have Breakfast, Play Tiny Tower'. It's an endless game, as there is no limit to how tall your tower can go, so I'll be playing this for many more years to come. When I need to look something up on wikipedia, I always use Wikipanion, not just because it's a full featured, easy to navigate wikipedia app, but because it has multiple wikia support, which is great for viewing topic-specific wikis as well as the standard wikipedia. I like keeping a close eye on my money, however, My bank doesn’t have an app (yes, I should leave them.). Checkbook HD, allows me to keep a close eye on all my spendings offline, so I can see at a glance how much money I have at any given time. I've got multiple accounts, and the app adds up all my money to tell me how much I have altogether. Time to save for next Christmas.